Recent hint by Senate President Bukola Saraki about the possibility of his joining the 2019 presidential race is now causing ripples in the Peoples Democratic Party (PDP) to which he defected from the All Progressives Congress (APC). Saraki told Bloomberg on Tuesday that he was “consulting and actively considering” throwing his hat in the ring for presidency. What are his chances of winning the Presidency? His comment, The Nation, gathered has upset calculations in the PDP about the chances of the various presidential aspirants. Other PDP members who are seeking the party’s presidential ticket include former Vice President Atiku Abubakar; Governor Aminu Tambuwal of Sokoto State; Governor Ibrahim Dankwabo of Gombe State; a former Minister of Special Duties, Tanimu Turaki and a former governor of Kaduna State, Senator Ahmed Maikarfi. The rest are two former governors of Kano State, Senator Rabiu Musa Kwankwaso and Alhaji Ibrahim Shekarau; former governor of Sokoto State, Attahiru Bafarawa; former Jigawa State governor, Sule Lamido; and an industrialist, Dr. Baba Datti Ahmed. Saraki may be aspirant No.11 if he eventually makes up his mind to go for it. Party leaders are already expressing deep concern over the large number of the presidential aspirants. Party sources said Tambuwal in particular feels disappointed that Saraki may join the race after allegedly promising to support the former Sokoto governor. Sources close to Tambuwal claimed that Saraki had previously given a commitment to back the governor’s aspiration. The source, who asked not to be named, further revealed that the ‘understanding’ which Tambuwal considered sealed and irrevocable, was one of the factors that encouraged the governor to join the race. The pact was said to have been reached when the two were still in APC but had concluded their defection plans. 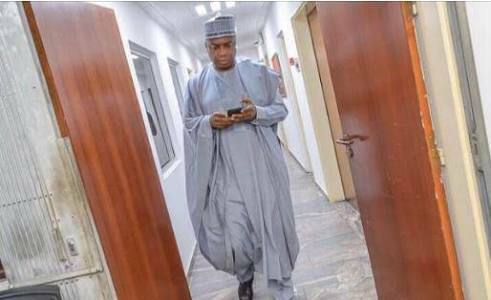 Sources in Saraki’s camp said the Senate President might have been spurred on by the July 22 ruling of the Supreme Court which dismissed the asset declaration charges against him at the Code of Conduct Tribunal. Riding on the crest of his freedom from legal encumbrances, Saraki announced his defection from the APC to the PDP a few days after the Supreme Court’s acquittal. Some PDP stakeholders are uncomfortable with the number of aspirants in the race. They fear that the outcome of the primary election could trigger discontent among some key aspirants. This, according to them, might affect party loyalty and cohesion, a situation that could jeopardise the chances of the PDP in next year’s election. But the leadership of the party has dismissed the fears, saying such a situation would not arise in the PDP again as the party has learned its lessons from the fallout of the 2015 presidential election and the consequent loss of power at the centre. Spokesman for the PDP, Kola Ologbondiyan, told The Nation yesterday that the party has a mechanism to guarantee a level playing field for all its aspirants in the primary election. Ologbondiyan said that Saraki was yet to inform the party of his intention to vie for the ticket, stressing however that he would be welcome into the race anytime he decides to join, just like others. The party spokesman said: “Dr Saraki will officially notify the party whenever he decides to join the race,” adding that as a Nigerian, it is his right to aspire to any elective position of his choice. He ruled out the possibility of discontentment arising from the selection process, saying the party would not give any of the aspirants reasons to complain. “The eventual winner will emerge through a free, fair and transparent primary election that will be attested to by all the participants. “We believe that at the end of the exercise, the best candidate who knows the nuances of our country and who can defeat President Muhammadu Buhari will emerge through a transparent process,” Ologbondiyan said. Saraki, shortly after his defection, visited former military president Ibrahim Babangida in Minna and ex-President Olusegun Obasanjo in Abeokuta in what observers say is part of the ‘consultations’ about his aspiration.